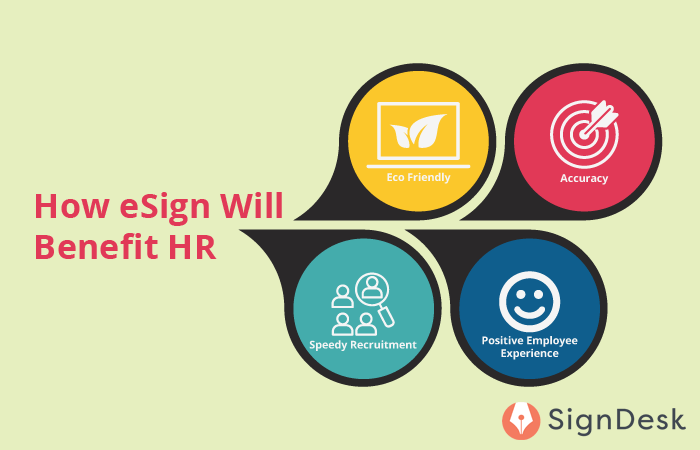 How Can eSign Benefit The Human Resource Department In India? How Can eSign Benefit Human Resources In India? When organisations hire, the procedure of signing employment forms is a way to get to know their employees better. Employees who sign job offers and contracts find themselves in situations where traditional hard copy paperwork becomes a time consuming affair. Since the Human Resource Department relies on timely, secure and lawfully binding procedures, the need for a digitized way of electronically signing documents would enhance a secure and faster way of getting legal documents like offer letters, termination letters etc. However, a paradigm shift from traditional signing to electronic signing of any legal document could secure you with forgery-free and tamper proof documents. In short, electronic signatures automate business processes by getting rid of hard copy paperwork. Here are reasons why the HR Department should switch to eSign documents. Why Should HR Departments Consider eSignatures? New employee paperwork requires a lot of signatures and is considered to be a problematic issue for HR professionals. Paperwork gets time consuming when you need to customize each document. This poses a problem to the HR Department while they need to focus on recruiting top talent. Electronic signatures can help you work faster. Legal documents that need to be signed are usually pre-drafted templates that require an employee to read and digitally sign it. Candidates can just eSign new employee forms and other agreements related to the hiring process from anywhere and at any time. This helps in building a speedy recruitment method of digitally staying ahead in the race. Using electronic signatures right from the recruitment phase to eSigning business documents, will help you stay ahead in the digital race. It expresses a notion of digital growth and progressive understanding of their workforce. This builds a positive employee experience that will help the business stay ahead. When preparing new employee hiring forms, potential mistakes are likely to crop up. Such errors affect the productivity of an employee in an organisation. eSign documents are templates that are pre-drafted by legal experts. 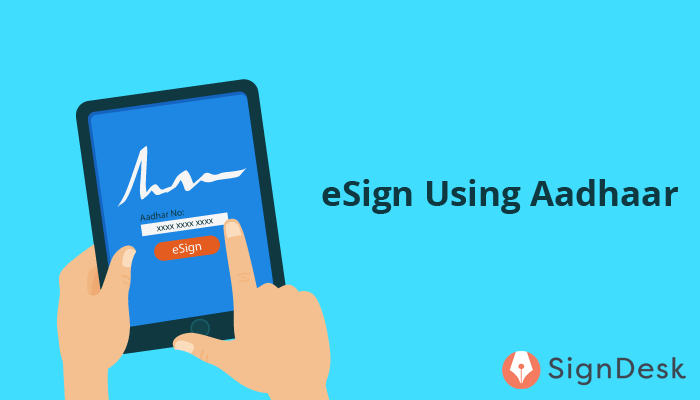 Thus the use of eSign makes signing legal documents accurate. On the contrary, HR department’s stay compliant with vital laws, audits and processes. Electronic signatures make sure these discrepancies are reduced, especially when preparing employee tax forms. HR processes are hard, especially when dealing with many documents. For instance, checking if every employee has signed all the new hire forms and which stage they are in the hard copy signing process. With this electronic signing solution, you can identify the stage of each document or form. In case anything has been avoided by an employee, auto-reminders are sent thus making the process automated and informed. Any Aadhaar card holder can electronically sign a document anywhere and any time. The accessibility of eSigning is an added benefit to citizens of India and would virtually empower every citizen of India to avail the facility of signing documents digitally in a cost and time effective manner. Electronic signatures do not require manual verification of credentials. This would help the Human Resources Department to help employees and CEOs sign all legal documents from anywhere and at any time. Imagine having multiple signatories on a single legal document and the time and effort it would require to get the document signed. You can eSign a document and immediately request multiple signatories to electronically sign it in a minute. Traditionally, the manual process of signing any document waved a huge span of time that was involved, thus limiting HR professionals from accomplishing their daily tasks at work. eSign is the right substitute for such issues as it offers digital security and is time consuming. India is a fast growing economy and the job opportunities are immense. Thus manually signing any document becomes a mere time consuming aspect catering to 1.4 billion people in our country. The future is here as eSign makes a mark to solve macro and micro issues in the Human Resource Space. Hiring and firing employees are two vital tasks of the HR Department. There are several sub-clauses under each which may differentiate the process of manually signing and electronically signing a document. A business may have many processes under its ambit and the amount of job vacancies are budding in the country. Moreover, with such heavy paperwork and signatures required for an individual document, the amount of time required to complete the task is large. There could be possibilities of committing minute errors while creating a manual business document to an offer letter. If you want to overcome the hurdles of inaccuracy and time consumption, we at SignDesk provides eSign services for your business. Your business needs to be ahead. So join us in our quest to make digitization a way of life.